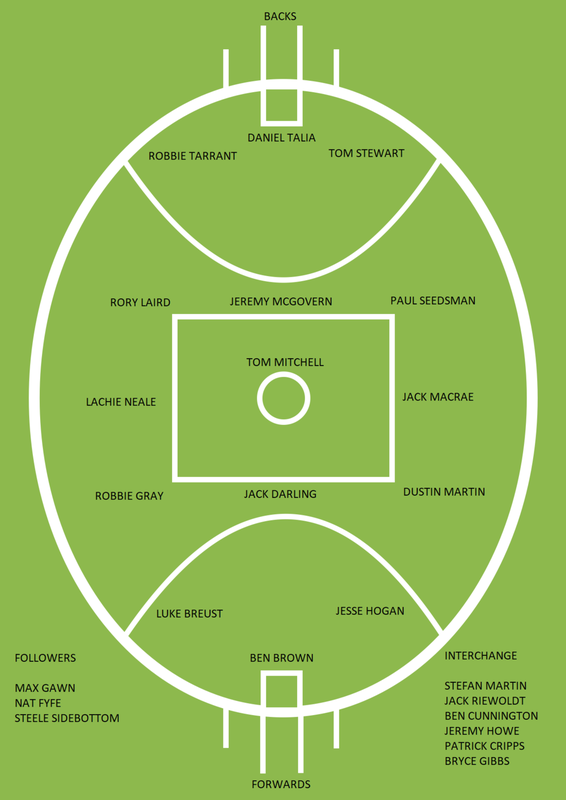 The Mongrel's All-Australian Team after Round 9 — The Mongrel Punt Become a Patron! It’s been two rounds since we explored which players are playing the best individual footy in the AFL, and things are a-changing. Round by round, injury by injury, and performance by performance we’re seeing players emerge and others fall from contention. Things are now getting interesting. Some of the players knocking on the door (not in our last version of the team) are stiff to miss out. Some incredibly stiff, but there are only so many players we can fit into a team, and some will inevitably be snubbed. Just who is sitting in the Mongrel’s rolling All-Australian team at the conclusion of Round 9? It’s too hard to leave Tarrant out of this side. He rarely loses a contest and reads the ball so well. He battled to a draw in the Richmond game, and did the same in the game against the Giants. He has the body of work to this point to retain his spot, but will need a clear win to keep it over the next two weeks. Talia made one error on the weekend, when he went for the ball at ground level, and Lukas Webb of the Western Bulldogs fell over the top of him. That’s it. For the rest of the night, he was supreme. That was on the back of a performance that held Charlie Dixon goalless the week before in the Showdown. Talia was our Round 7 full back, and there is no reason to remove him from that post based on the last two weeks. He is retaining his spot despite an average game against Essendon on the weekend, but he had a lot of friends who did not perform up to standard. In Round 8, however, he was brilliant against the Magpies, compiling 28 disposals and 9 marks, peeling off Will Hoskin-Elliott and providing plenty of run off half back. He’s been a bit quieter, but he set a standard through the first seven weeks that's almost impossible to maintain. He was exceptional in the showdown, and had a ripping head-to-head clash with Chad Wingard, and followed up with 28 touches against the Bulldogs in the pouring rain in Round 9. Laird is one of only a few who has a mortgage on his spot in the side at the moment. Really stamped his mark on the centre half back slot in Round 9, particularly with his early intercept marking and later thumping spoils. Though he missed the week before, Gov was a brick wall across half back for the Eagles in their win over the Tigers. You’d think that McGovern’s absence in Round 8 may have hurt his chances. Not so. The season he’s putting together is exceptional. He still leads the league in metres gained, and still hurts whenever he gets the ball. In wet conditions in Round 9, he had 22 disposals and sent the Crows deep into attack more any player on the park. In Round 8, in possibly the game of the year, he was a little quieter but used the ball beautifully when he got it. He has been excellent this year, and is working at a level so far above that which he’s produced in his career prior. Neale has continued to play Robin to Nat Fyfe’s Batman. Actually, perhaps Neale is more like Nightwing (look it up… I had to) than Robin. He had the standard 32 touches against the Saints in a win in Round 8, and followed up with another 30 as the Swans gave the Dockers a bath in Round 9. Win, lose or draw, Neale is the in-and-under distributor that drives the Freemantle midfield. Again, Fyfe gets all the attention, but Neale is the workhorse. He leads the league in disposals, is third in contested possessions, second in metres gained, first in clearances, first in centre clearances, and first in stoppage clearances. Do I have to go on? He had only 20 touches against the Swans, but bounced back with 46 against the Lions in Round 9. Some have criticised him for not hitting the scoreboard, but five goals from an inside mid is not a bad return to this point. Keeps going from strength to strength. He went from a career-high 47 touches in the Bulldogs’ win against the Lions to having 36 more in the wet against the Crows in Round 9. Macrae is averaging at 34.1 touches per game and keeps running when everyone else stops. He finds space but also wins a lot of his own ball (he had 25 contested touches against the Crows). Did the third quarter against the Crows make you a believer? On one of the biggest stages of the AFL season, Gray delivered in a big way. His five goals sparked the Power, and put them in a situation to go on and win the game. While his game against the Suns in Shanghai was much more subdued, and inaccurate kicking reduced his impact, he remains one of the most dangerous players in the game. Wow… Jack Darling has been amazing this season. From filling in for Josh Kennedy at full forward to emerging from his shadow to become the difference in this week’s top of the table clash, the emergence of Darling has been incredible. I remember watching Darling years ago and thinking ‘he could be something’ and here we are… he is something – right now, he’s the best centre half forward in the game, and one of the easiest choices thus far. There’s a few rumours doing the rounds that Dusty is playing hurt. Maybe he is, or maybe they’re excuses for him dropping off a little in output this season. Still, 24 touches a game and over a goal a game is nothing to sneeze at. All that said, for the first time in the last couple of years, Dusty isn’t an automatic selection. Breust remains the only man in the league with a legit shot at reaching 100 tackles and 50 goals in a season. He currently sits at 23 goals and 43 tackles with a couple of games remaining until the half way point. Why am I so caught up in this 50/100 stuff? No player has ever done it, and I dig weird stats. Again, this is a simple selection. If you’re leading the race for the Coleman at this stage, you’re a lock for the full forward spot. Is he the new Nick Riewoldt? Sorry… I just heard that on ‘On the Couch’ and I’ve repeated it here like a parrot. No, he’s not the next Riewoldt – he’s doing fine being Jesse Hogan. He works his backside off up and down the ground and runs his opponent’s ragged. Toughest position on the ground to pick at the moment. You have Gawn playing consistently well and kicking goals, which is what puts him over the top. Seriously, one poor game could see Gawn from starting ruck to out of the team. That’s how hotly contested this position is. He’s now the Brownlow favourite, and for good reason. Fyfe is a contested ball beast, and attracts attention with his aerial exploits. Here’s a stat for you to mull over. In his Brownlow year, Fyfe was averaging 28.8 touches, 4.2 marks and eight clearances. This season, he’s averaging 31.2 touches, 4.4 marks and eight clearances. If he stays healthy, we could have another dual Brownlow medallist on our hands. Sidey just keeps chugging along. He’s now a definite A-grader, and his consistency is his greatest weapon at the moment. In the loss to Geelong, he had 30 touches and then he had a rather subdued 38 disposals as the Pies ran over the Saints. The Collingwood midfield is a strange beast. Pendlebury is all class, Treloar is a jet, and Sidebottom is like your old pair of shoes – when you’re looking for something that fits, and you know will get the job done, you slip them on. He’s as reliable as they come in the league at the moment. So this bloke is keeping Brodie Grundy out of this side, as I didn’t want three rucks in the team. He was great against the Bulldogs, notching 50 hitouts to go along with 20 touches, and followed it up with 19 touches and 28 hit outs against the Hawks. Some might be in favour of Grundy in this spot, but I thought Martin was better in their clash in Round 7, and he has only lowered his colours once this season; to Gawn in Round 2. As I said above, this situation could change in the blink of an eye. The Gawn-Martin-Grundy triangle is the most interesting storyline in the All-Australian picture currently, and sure to be one that raises eyebrows as the season progresses. As a lot of the attention has been centred on Ben Brown and Jack Darling, Jack Riewoldt has chugged along, continuing to be the marking option for the Tigers and anchoring their forward set up. He’s also quietly moved into third place in the race for the Coleman. As the Tigers lay down at the feet of the Eagles, Riewoldt was one of the few to stand up for the entire game. His last four weeks have yielded three, three, two and five goals. Great consistency in a balanced forward line. You know what I loved most about Cunnington’s season? The silence. Here he was, breaking a record with 32 contested disposals and when the press came knocking, he wasn’t interested. But that’s an aside – his work on the field has been wonderful. He’s an unsung hero that is only now starting to receive the plaudits he deserves. Best on ground against the Hawks and Richmond, and incredibly consistent, game in and game out, Cunnington is making people sit up and take notice. Back to back 30 disposal games have thrust Howe into the conversation as a possible AA backman. There was a time I thought that statement would’ve been ridiculous. He has had 11 marks in each game over the past two weeks to complement those high disposal numbers, and continues to spoil effectively when allowed a run at the ball. His defensive work against Patrick Dangerfield when the Cat drifted forward in Round 8 was fantastic. He’s a tale of highlight forward going to the back line being a huge success. I just found it too difficult to remove Cripps from the team. He’s continually stood up this year, even as his team has fallen down. He was a contested ball powerhouse in the Blues’ first win of the year against Essendon, collecting 19 contested disposals, and actually bettered those numbers in their hammering at the hands of Melbourne, with 23 contested disposals. Win or lose, you know you’re going to get a great contest from Cripps. I extended the bench to six just to get Gibbs in. He has been brilliant in his first season as a Crow, and with the rash of injuries the Crows have suffered, he has been the remedy to many of their ills. Statistically, this is not Gibbs’ best season, but in terms of impact, it could very well be. He is ticking over at 26 touches per game but his 12 contested touch is better than he’s ever produced. Adelaide have needed him to be more physical, and Gibbs has obliged. David Astbury - Having him in last time was based largely on his unsung ability to stop his man in one-on-one contests. He was thrown at Darling after Rance was mauled, and got mauled as well. Still right in contention, but others were consistent over the last two weeks. Astbury was not. Mark LeCras - Incredibly unlucky. Had three goals against the Tigers, bobbing up here and there, but was quiet against the Giants in Round 8. He and Breust are dueling for the small/mid forward spot at the moment. Breust has been a bit better. Stephen Coniglio - Had 29 and 25 disposals the last couple of weeks, but I watched both games and he did not hurt the opposition at all. Both he and Dylan Shiel are still right in the mix, but their team needs them to be better than they are at the moment. Both guys have been a little down since the last time we put a team together. Both need good weeks upcoming to shore up their spots. Can't believe I'm saying that about Dusty. Other than those who dropped out this week - Brodie Grundy, Andrew Gaff, Jake Lloyd, Tom Phillips, Jared Polec, Lachie Hunter, Elliot Yeo, Dylan Shiel, Scott Pendlebury, Shannon Hurn, Jack Crisp, Jack Gunston, Neville Jetta, Ben Jacobs, Tom Jonas, Nick Haynes. And here's a chart for wankers on reddit who need it because reading is beyond them. And there we go. This was a lot more difficult this time around. There are quite a few we pondered before making a call. We’d love to hear your thoughts on the team and how it’s shaping up. Give us a like on our Facebook page, or a follow on Twitter and have your say. Or just stalk us… we are a big fan of stalking. What’s your address? Newer PostAre the Gold Coast Suns a Failure?